White House Continues To Dodge Roy Moore Scandal (And Trump's Accusers Are Still Total Liars) [VIDEO] - Joe.My.God. 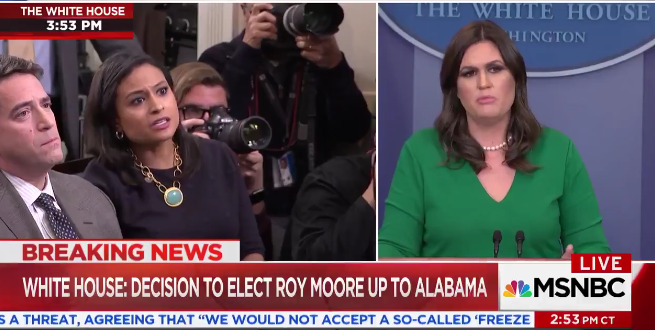 White House press secretary Sarah Huckabee Sanders on Friday once again refused to say whether President Donald Trump believed the accusations against U.S. Senate candidate Roy Moore. Asked about Moore, Sanders pointed to a statement the White House released last week, when revelations of sexual misconduct against Moore were first published in the Washington Post. When asked earlier about the difference between Trump and Sen. Al Franken (D-MN), who was accused by a radio news anchor Thursday of forcibly kissing her and groping her while on a USO tour, Sanders pointed to Franken’s apology. “Senator Franken has admitted wrongdoing and the President hasn’t,” she said. “I think that’s a very clear distinction.” Sanders separately repeated, when asked, the White House’s line that the numerous women accusing the President of sexual harassment and assault are lying.